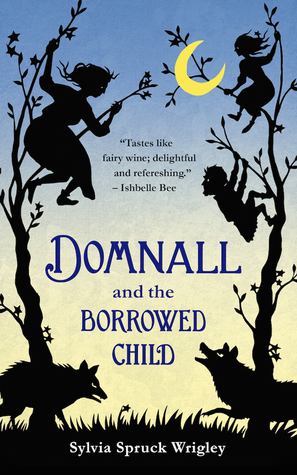 Domnall and the borrowed Child is a quick and easy read that breathes new life into some of the old fairy myths. At the start of the story we are introduced to Domnall, an old and rather grumpy former scout. He is tasked with helping one of the fae children who has fallen grievously ill, the only known cure being mothers milk. And so the story turns into one about changelings but in this particular case we’re going to be given the fae side of things. For a bit of background, the world of the fae seems to be in decline for reasons that are left unexplored here. The fairies and the Slaugh went to war with each other and many of the fairies were killed. Therefore every child is precious and the act of swapping a human child for a fairy one is sometimes the only possible hope for a cure. Changelings are greatly abhorred by humans – I guess we take it a bit personally if somebody steals our babies and leaves an imposter in their place. The fae don’t really hold things in the same regard, they see this as a necessary action and whilst they normally try to avoid human settlements they will go to great risk in such cases. After all – they’re only borrowing the child for a spell. Anyway, long story short the best laid plans have a way of going awry and that turns out to be the case here. Domnall is the central character of the piece. He’s old and creaky and a bit naffed off about the way things have turned out. It turns out that all the best fairies were killed in the war and the ones left are a bit of a useless bunch – well, if we are to believe Domnall that is. I’m not sure how reliable a narrator he really is. He seems to think he’s a great scout and yet he seems to quite easily get into trouble encountering unruly sheep and wolves along the way. I can’t really go into great depth with this as it’s only a fairly short story so would be very easy to spoil things. Basically, this is a light hearted adventure from the fae world that brings to us a different view on the changeling theme. We find out a little bit more about fairy revels and enchantments. We learn it might not always be a good idea to drink the dew from the bluebells and we pay a visit to the local brownies. This is sweet and slightly different than the normal fairly tale. I think my only real criticism is that I would have liked more in fact I think this could definitely have been filled out and given a bit more depth. As it is, short and sweet. I received a copy courtesy of the publisher via Netgalley for which my thanks. The above is my own opinion. That is indeed an interesting take on the changeling story! “not always be a good idea to drink the dew from the bluebells”…what a curious thought 😛 I love the cover! The cover really drew me in to be honest. It is an interesting story – and I can’t say why but yes, don’t drink the dew! I’ve been curious about this one. Glad to hear it works, sometimes short and sweet is just what is needed. Yeah, it was a very quick read – and enjoyable. I think it would have been really good it it was fieshed out. That’s always my big problem with shorts and novellas; if I ever give one a mediocre to okay rating, the reason always seems to be a want for more depth. It’s a difficult challenge to fully develop a story and characters in so few pages. It is definitely a challenge. I really liked what the author has done here and would have really enjoyed reading something a bit deeper. Haha – maybe! Unfortunately a ‘spell’ in the world of fae is usually a long time in our terms. It is a lovely cover. It definitely drew my eye.